mrs washingmachinepost and i figured that a christmas movie would be the very entertainment to while away several hours on a virgin pendelino when returning from our hollybags. sentimentality to which we are both more than happy to admit, dictated that we download white christmas, an act that took several hours over the fragile broadband connection in our holiday abode. thank goodness, therefore, for apple's ipad on which we shared a pair of white earbuds, while the gents sat opposite discussed the iniquities of their employment situation just a tad louder than was absolutely necessary. though danny kaye seemed fairly adept as a dancer, it was notable that the real dancing star was vera ellen, partnered in the principal dance scenes by a gent who was neither bing crosby nor danny kaye. and though it ill behoves me to have noticed, in each of these real dance settings, not only were ms ellen's shoes colour co-ordinated with her dress, her gentleman dance partner was similarly co-ordinated. however, if any of you mention i said this, i'll wholeheartedly deny it. it was a cleverly orchestrated ploy that demonstrated impressive attention to detail by director michael curtiz, one that will broker no disagreement from the majority of female viewers who are presumably more than used to colour matching items such as shoes and handbags along with other decorative paraphernalia. those of us of the male persuasion, who have studiously observed rules five and nine throughout our weekly pelotonic activity, will obviously have no truck with such superficial fripperies. after all, which of us would check that our helmets matched our saddles, or bibtights paired accurately with softshell gloves? or maybe one of those winter hats that clicks with your socks? 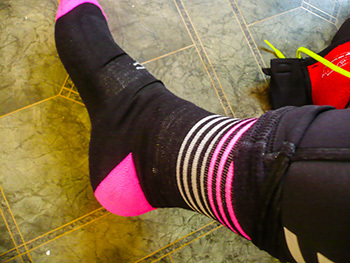 oddly enough, that is precisely the shine that this-is-cambridge have placed upon their latest omloop winter hat coupled with an impressive pair of cosy socks. both of these feature black and a pink that verges on fluorescent, all but hidden on the footwear (let's face it; this is winter. socks are inevitably concealed beneath shoes and thermal overshoes), but unmistakeable on the omploop cap's thermal ear covering. 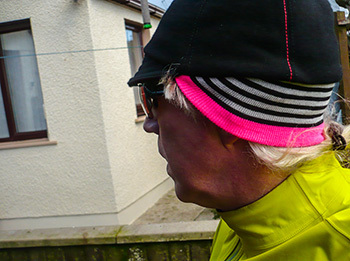 with the exception of the pink bit, the rest of the cap pays great tribute to the efficacy of merino wool. most of the summer and winter caps on the market feature peaks that gain their rigidity from a thin plastic insert. daphne and andrew at tic insist that the peak be constituted purely from merino thus avoiding any untoward pressure on your furrowed brow. as far as i can tell, they may well be right on the money. the cap's really comfy under a helmet and the ribbed ear warmer can be folded up when in the warmer, coffee imbued atmosphere of debbie's. in the bite of an atlantic headwind, even mr spock's ears would have been more than just tingly. under more normal conditions, the matching lycra and nylon reinforced merino socks could retain a sense of stoic anonymity during any perambulations of the hebridean estate. however, recent and unprecedented rainfall has endowed many of our usual haunts with a depth of standing (and flowing) water, depths that have need of being traversed on two wheels. naturally enough, even synthetically reinforced merino wool cannot claim to offer anything like a waterproof countenance, something that i conclusively proved on the corner just down from the phone box at carnduncan (just before you turn off for the art gallery at sanaigmore). 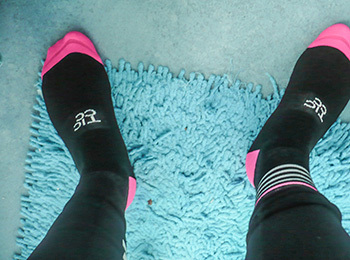 those holes in the sole of thermal overshoes rather mitigate against waterproofing too, just so's you know. it's barely even mid december at present and i think i'd be safe in saying that there's a lot worse to come yet, meteorologically speaking. 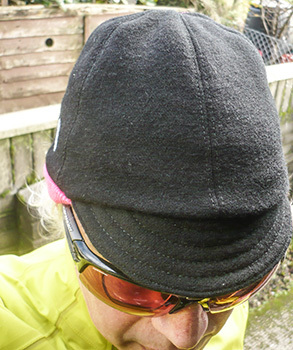 this portended worseness won't go away, but it can be somewhat ameliorated by equipping yourselves with an omloop winter cap and a pair of matching omploop winter socks. if you're a bit of a show-off, you can always remove your shoes in the café.